George Hamilton Constantine was a prolific British artist. He was born in Sheffield, the son of Francis Alfred Constantine, a saw maker. In the 1901 census, aged 24, he was living with his parents at 113 Crookes Road, Ecclesall, Sheffield, and was described as an artist and sculptor. His uncle, William Hattersley, paid for his education at Sheffield School of Art where his peers included Stanley Royle and David Jagger. He then studied the restoration of pictures at the Courtauld Institute and was involved in the conservation of painted ceilings at Chatsworth House. During the 1930s Constantine was assistant to John Rothenstein, first Director of the Graves Art Gallery in Sheffield and was Director himself from 1938 until the 1950s. Rothenstein and Constantine were key figures in broadening the 20th century British collection which John George Graves, its benefactor, had begun. He was a member of the Sheffield Society of Artists and was its Honorary Secretary throughout the 1930s. Constantine exhibited at the Royal Academy (1916 ), Carlisle Academy and Athenaeum, Dumfries Gallery, Abbot Hall in Kendal, Glasgow Institute of Fine Arts, Lake Artists’ Society, Walker Art Gallery and galleries in Manchester, Lancaster, Huddersfield and Rotherham . He is best known for his watercolours of landscapes with figures, marine paintings and seashore scenes. These were often views of the Yorkshire and Lancashire coasts and of Cornish scenes. His rural pictures often included the two horses which lived on the Constantine family farm near Sheffield. He did not need to exhibit his work widely as there was steady demand for it from dealers in this country and New York. His work is now widely collected along with others of the Sheffield School. The fine quality of Constantine’s work and its appealing subject matter make his pictures as popular today. Constantine died aged 91 in Wortley, Yorkshire. 29 August - 9 October 2013 in the Fylde Gallery. It had previously been shown in 'The Treasures of Lytham St Annes Art Collection', 31 May - 25 July 2012. 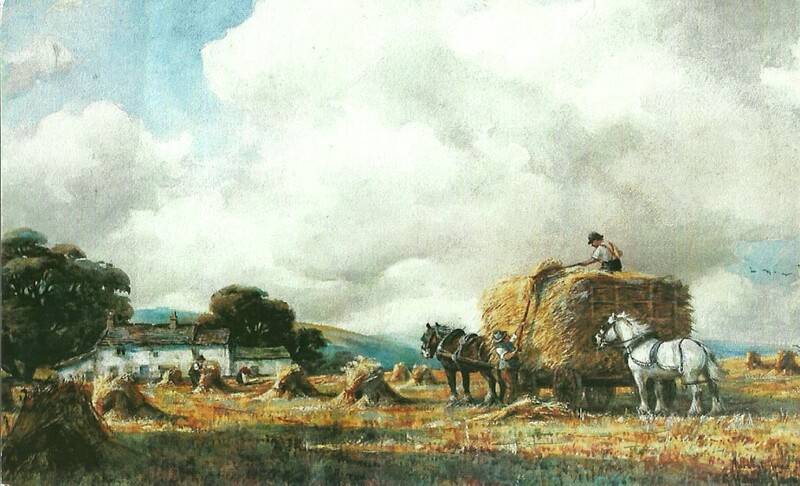 This delightful painting depicts a busy scene where farm labourers gather in the corn and bundle the sheaves into stooks to dry upright in the sun. The horses, in full harness, stand patiently. On the left the whitewashed farm buildings can be seen with the rolling hills beyond. This watercolour, with its warm palette, is a mix of fine detail and broad washes of the expanse of sky, which takes up over half of the painting. The collection was sold on 7 September 2010 at St Peter’s Assembly Rooms in Hale, Cheshire. Constantine’s youngest son, Frank Constantine OBE (1919-2014), as Director of Sheffield City Art Galleries from 1964 to 1982, took Sheffield’s Art Collection to a standard that rivalled that of many other British cities.